Easily transition from sitting to standing. 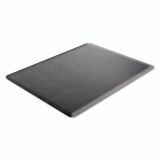 Non-slip bottom surface grips hard floor surfaces and reduces the need to reposition the mat. 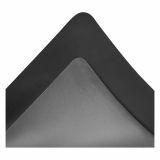 deflecto Ergonomic Sit Stand Mat, 48 x 36, Black - This dual purpose cushioned mat combines the comfort and ergonomic benefit of an anti-fatigue mat with the smooth rolling surface of a traditional deflecto office chair mat. Designed for use with standing desks and adjustable height workstations. 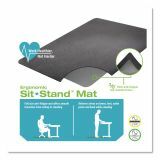 The mat is ideal for users looking to transition effortlessly from sitting to standing. 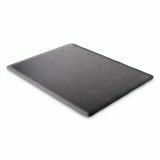 With 3/8" thick anti-fatigue support foam, this mat is comfortable on the feet, promotes wellness and reduces fatigue while standing. 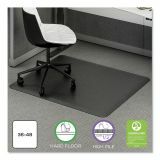 It also protects flooring from wear and tear caused by wheeled office chairs. 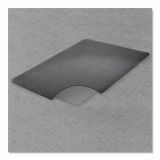 The mat can also be used to cover worn, damaged or stained flooring. Use with wheeled office chairs or stools. Use to cover worn, damaged or stained flooring.